Due to the rising waters in the Mighty Mississippi River which are due to crest in New Orleans on May 23 we have made the decision to reschedule Lord Jaganatha's Ratha Yatra and Festival in Washington Square Park. Although flooding is not expected in New Orleans we feel people will not be in a festive mood. There is much devastation along the Mississippi drainage area and certainly chanting is needed. We will take Lords Jaganatha, Baladev & Srimati Subhadra out the temple on Sunday, May 22 to tour the local neighborhood while Their devotees chant Hari Nama Sankirtana. As usual a feast will be served. Let me repeat: Our New Orleans Festival in Washington Square Park on May 21 & 22 is being RESCHEDULED for November 19 & 20. This includes the Parade. Here's our Tentative schedule for 2011. Updated June 14, 2011. Please check back soon. We'll be adding confirmations as soon as we receive them. I hope to see you at a festival this summer. Hare Krishna! The Diamondback features "Festival of India"
Students seeking a taste of Indian culture weaved through colored tents on Hornbake Plaza for two days this week, but what they received at the Bhagavad Gita Club-sponsored event delved much deeper into spiritual Hinduism than into cultural customs. Making its second visit to College Park, the Festival of India is an exhibit that tours North America to provide a "resource to the world for exploration and self-realization," according to the festival's website. Yesterday and Wednesday's events followed the festival's smaller first appearance in the spring, but cooperation between the club and Student Entertainment Events boosted this round's publicity and attendance, said SEE Special Events Director Cassandra Fritz. "This is a great event to co-sponsor because it's really diverse," Fritz said. "We don't usually do these things." The Bhagavad Gita is a sacred text containing the teachings of Lord Krishna, whom Hindus believe to be a manifestation of God. 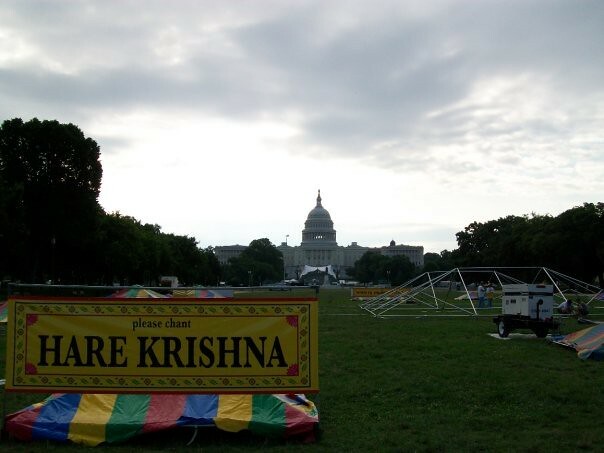 Many of the festival's eight tents contained posters addressing spiritual concepts such as karma, reincarnation and meditation as they are explained in the text, with the intention of urging onlookers to explore "the complexities of introspection," a fundamental goal of the university's Bhagavad Gita Club. A tent called "Spiritual Fashions" sold racks of clothing and accessories stamped with the Hindu syllable "Om," a transcendental sound vibration used in meditation that symbolizes absolute truth, said Danielle Lella, president of the Bhagavad Gita Club. Around her neck, Lella wore Tulsi beads - also sold at the event - which she said are a symbol of spirituality supposed to fight off bad energy. "We believe it is possible to be in a peaceful state 24/7," she said. "This necklace says I'm endeavoring in spirituality." A central tent called "Free Feast" offered large plates of Indian food, including seasoned basmati rice and vegetable curry. University Hindu chaplain Kiran Sankhla said all food was made fresh and served shortly after it was cooked. She recommended halavah, a dish made of pineapple, raisins and farina, for which she said guests, such as junior government and politics major Dor Zmora, returned seeking seconds and thirds. "It's really delicious," Zmora said. "I am definitely planning to check everything out after I eat." Lella said she hoped to educate students on some of their beliefs as well as feed them. "We hear about karma and reincarnation all the time, but what do they mean?" she said. "I want to show people it is very real." Lella said she believed the crowds at the event were not due to the food but rather to students' attraction to spirituality. "[Students] may find that their materialistic way of life is unsatisfying," she said. "They may be really ready to stop dwelling on what's petty. That's what we offer." One display about vegetarianism featured a large spread of steak next to a list of various toxins and hormones beneath the large, black title: "What's Really in that Piece of Meat." Jahnavi Sankhla, a university alumna who is still actively involved with the Bhagavad Gita Club, said all of the event's food was made vegan. Senior psychology major Sevan Jackson, a vegetarian, said he appreciated the gesture. "[The festival] was a really good opportunity to gain insight into a different culture," Jackson said. Lella said she was pleased with the event's turnout and described plans to hold a larger festival next semester on McKeldin Mall. "It [was] awesome and really well set up," Fritz added. "I knew it would be received really well." Read more about The Diamondback features "Festival of India"